An extension for a 6-Pin Mainboard connector, approximately 32cm long. 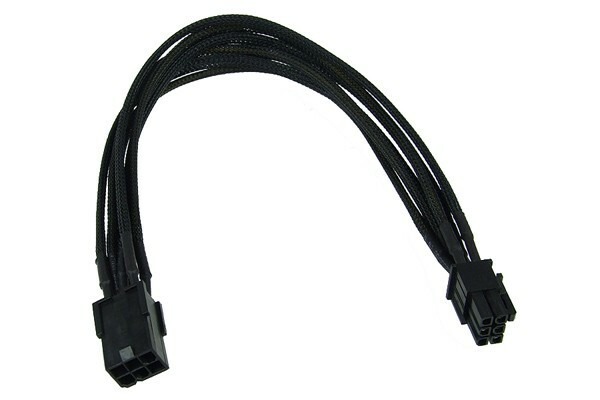 This cable can be used to bridge even longer distances between the PSU and graphics card. Especially when trying to achieve a clean cable management this cable is ideal to make creating an uncluttered interior easier. This is the new generation of sleeving with individually sleeved leads! The surrounding mesh, also called mesh, which is surrounding the cable itself offers the advantages that every Pro-modder is looking for: A completely unique look, even of the cables in the system! Special attention was paid to the combination of cable connectors, sleeve and heatshrink which were used to ensure great design and a unique as well as elegant look.